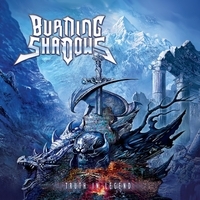 BURNING SHADOWS, from the town of Savage, USA, were formed in 2000 and issued two albums, “Into the Primordial” in 2008 and “Gather, Darkness!” in 2012 before independently releasing “Truth In Legend,” on May 5 this year. The band label themselves as “Facemelting Epic US Metal” on their website and did not turn out to be the overhyped disappointment that appellation (and indeed the discovery that one of their songs is inspired by Skyrim) suggests. There are three people credited with vocals on this album, but as Tom Davy is the lead I will assume it’s his pipes we’re treated to here, and what a gift it is. Imagine a combination of Rob Jalonen from NOBLE BEAST and Matt Barlow from ICED EARTH with the best of each. Guitar work is excellent, a balance of melody and crunch with just the right amount of thrash thrown in, while the bass gets to meander a bit here and there. The rhythms and composition change often enough to supplement the engaging riffs, while the keys are used sparingly to add another layer of sound. “Truth In Legend” gets points right off the bat for “Day of Darkness”, a song about the Knights Templar that isn’t an idiotic infantile polemic scrawled out in five minutes in eighth-grade prose about the dangers of organized religion, and in fact details internecine geopolitically-motivated violence within Christendom (Sympathy for former Crusaders? God forbid…). They not only make this the opener but include a brief history of the event in the lyric video. It’s an awesome song too, full of energy with a rousing chorus. The album varies fairly well, staying well within the bounds of melodic power/thrash with a number of standouts. “Sworn to Victory” gives a very good impression with its heavy Solstice influence weaving medieval metal sensibilities into the band’s sound. “From The Stars” has a more sinister air of the sort you might expect from ICED EARTH and MANTICORA, and it’s a well-executed tonal shift. “The Last One to Fall” features at 1:22 an up-tempo pre-verse riff with mid-tempo key changes that hits that perfect middle ground between manic and confident that makes for the best in power metal. The song’s bridge, second bridge and chorus are all solid, each being better than the last. The guitarists also vitally understand how to move their fingers up and down the fretboard, meaning that the galloping riffs actually change key and create an actual melody of some sort instead of essentially serving as an aural stopgap as they do in too many bands to name. There are plenty of good melodies on here, but the compositions get a little repetitive. Arguably this is because the songs are too long – “Southwind” being a striking preliminary example, an unnecessary 6 minutes when its constituent elements would have made a good 4-5 minute tune. The final track “Deathstone Rider” is the worst case of this malaise, containing riffs that put me in mind of more recent SYMPHONY X’s OPETH-inspired material but also clocking in as 13 minutes. As it stands, the song is much too long and there’s no reason for it to be. BURNING SHADOWS are quite similar to ORDEN OGAN in that they’re a band with unrealized potential, and I hope they get their own “Gunman” soon. We need a continuous crop of modern bands to show the incompetent upstarts and lurching incumbents alike how it’s done and BURNING SHADOWS are well-suited to that role. There are a number of directions the band could take with their current sound, directions which they could indeed explore simultaneously on succeeding works. “Truth in Legend” stands as a solid power metal album with a strong central core and a couple of musical forays, and I hope it proves to be emblematic of their future work.